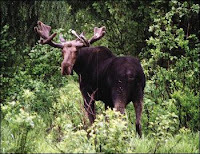 As I've mentioned before, moose are making a big comeback in the Adirondacks of upstate New York. The resident biologist is hitting the "Be careful driving!" message pretty hard lately since three moose have been spotted loitering in the neighborhood, heading South on Route 73, just outside of the Village of Lake Placid. Dawn and dusk are the particularly dangerous times, but you could see them anytime since anything is possible when it comes to love and this is their amorous time of year.